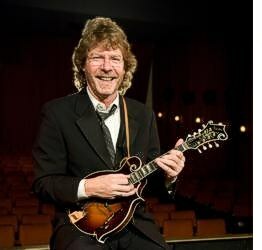 Born in 1952, Bush was exposed early in life to his father’s own bluegrass collection, and by age 11 he took up the instrument that he has been identified with for his more than five decade career – the mandolin. He soon added the fiddle to his musical arsenal and flourished on that instrument, taking top honors three times in the junior division of the National Old Time Fiddler’s Contest as a teenager. Bush began playing with the Bluegrass Alliance – a group of young, progressive pickers – before moving on to become a founding member of New Grass Revival in 1971. It was a new sound, fusing bluegrass music with the drive and intensity of rock ‘n’ roll. He was the Captain Kirk of bluegrass, pushing the boundaries of traditional technique on stringed instruments to boldly create new sounds that no one had heard before. While other musicians came and went in New Grass Revival, Bush was a constant and became the face of the group for 18 years until he started the Sam Bush Band in 1996, a group he continues to lead today. Bush’s “newgrass” musicianship has led to collaborations with other big name artists like Leon Russell, Lyle Lovett, Emmylou Harris, Alison Krauss, Tony Rice, Dolly Parton and Doc Watson. He demonstrates as much mastery of live venues as he does recording studios, and is a frequent artist at well-known music events like the Telluride Bluegrass Festival in Telluride, Colorado, Merlefest in Wilkesboro, North Carolina, and the Lonesome Pine Special Concert Series in Louisville. He is a lifetime achievement award recipient from the Americana Music Association and won a Best Country Performance by a Group Grammy Award in 1992 for his work on “Emmylou Harris and the Nash Ramblers at the Ryman.” He also earned Grammy accolades for his work in 1996 with Bela Fleck and the Flecktones on “Sinister Minister” and with several other performers on the soundtrack to the 2000 motion picture “O Brother, Where Art Thou?” Bush, who now resides in Nashville, was one of nine performers inducted into the Kentucky Music Hall of Fame in 2006, a class that included country music duo Wynonna and Naomi Judd and jazz vibraphonist Lionel Hampton. The Commonwealth’s most prestigious arts awards honor Kentucky individuals, businesses and organizations that make significant contributions to the arts in the state. Governor’s Awards in the Arts recipients exemplify a diversity of accomplishments in all areas of the arts as well as the irreplaceable value of those contributions to the state’s communities, educational environment and economy. The combined achievements and contributions of this year’s esteemed group of recipients demonstrate the many ways that citizens of Kentucky uphold the tradition of creating a rich cultural legacy.